You can operate this projector just as easy as using your smartphone! When you connecting it with wifi, surf the internet, watch online videos and pictures are both available. Native : 800x480 support 720p 1080p. ViviTek D791ST Ultra Short-Throw DLP Projector. Display Type: DLP. Ultra Short Throw Technology takes the Projector usage to a new level. You can expect large images in small rooms, eliminated eye glare and decreased screen shadows using this technology. LG HF85JA Projector. Lens Cover. Exquizon LED GP12 Portable Projector 800 480P Support 1080P HDMI USB SD AV Connect. Just do not hesitate to own one! A:Yes, you can. 1x HDMI, 1x USB, 1x SD, 1x VGA,1x AV. It has an exquisite design with high-level quality. LG PH450UG 450-Lumen HD Ultra-Short Throw LED Portable Projector. Condition is New. Shipped with USPS Priority Mail Large Flat Rate Box. THE ITEM IS GENTLY USED IN A VERY GOOD CONDITION. HAS BEEN FULLY TESTED AND IS FULLY FUNCTIONAL. WE WILL DO OUR BEST TO RESOLVE ANY ISSUES. NO EXCEPTIONS. We will be glad to work the situation out with you. LG PF1000UW Projector. on body and lens. 2865 North Berkeley Lake Rd, Suite 10. Light scratches and scuff marks. Lightweight (1.01 lb) very portable. Excellent for gaming. Can connect to 12V lighter plug for use in vehicle (power cord not included). Condition is Used. Projection Image. Works great only used for 1 year. It's a really big screen. Auto Keystone (Vertical), Manual 4 corner keystone. Digital Keystone Correction. Up to 30,000 hrs. Contrast Ratio. Versatile is the main feature of BL45. because of its multiple interfaces for different devices connection. Adopted with superior heat dissipation fan, BL45 has cut fan noise by half. Excelvan BL45. SMART UF55 DLP Projector Refurbished. Display Type: DLP. Internal parts, fans, connectors, lamp and filter have been professionally cleaned to improve projector performance and extend it's life. KEY FEATURES. Trending at $285.25eBay determines this price through a machine learned model of the product's sale prices within the last 90 days. Internal parts, fans, connectors, lamp and filter have been professionally cleaned to improve projector performance and extend it's life. Display Type: LCD. Lens is carefully refurbished. Image clear and bright, has no white spots or dead pixels. (17- Wifi: 2.4G/ 5G Dual Wifi. 16- Wireless projection function: Airplay、Miracast、DLNA. 2) Built-in Android 7.0 System, brings high network speed, more convenient. 4- Operation system: Android 7.0. 26- Projection Distance: 0.5 to 7.5 m.
ASUS S1 DLP Ultra Short Throw projector - 200 lumens - WVGA Condition is New. Shipped with USPS Priority Mail. Besides, built-in Bluetooth 4.0 enables BL46 connect with bluetooth speaker wirelessly either. For convenience, BL46 also with many interfaces for different devices connection. BL46 own a mini portable size 21cm 16cm 8cm and light weight 1.18kg. LG Smart TV Enabled. Contrast Ratio-150,000:1. Laser Class: Class I; Laser Output power: 0 mW (zero mW). we tested and inspected all the item to the best of our ability. However since we have different variety of product. SMART UF65 DLP Projector Refurbished. Display Type: DLP. Internal parts, fans, connectors, lamp and filter have been professionally cleaned to improve projector performance and extend it's life. KEY FEATURES. Therefore, it projects clear images with bright colors, bright whites, and deep blacks. This is the case, even in situations with high ambient lighting. The Vivitek D791ST is dependent on DLP technology for accurate color and detail reproduction. FREE Convenient Accessories Included by TeKswamp TeKswamp Warranty. SMART UX80 DLP Projector. ⦁ Display Type: DLP. Ultra Short Throw Technology takes the Projector usage to a new level. You can expect large images in small rooms, eliminated eye glare and decreased screen shadows using this technology. Ultra Short Throw LED Projector with Embedded Battery. - Screen Share (with Miracast, WiDi supporting device). - 30,000 Hour LED Lamp Life. NEW SMART UF70W DLP Projector Ultra Short Throw. ⦁ Display Type: DLP. Ultra Short Throw Technology takes the Projector usage to a new level. You can expect large images in small rooms, eliminated eye glare and decreased screen shadows using this technology. NEC NP-U310W DLP Projector. ⦁ HD Video Mode: 1080i. ⦁ Display Type: DLP. Ultra Short Throw Technology takes the Projector usage to a new level. You can expect large images in small rooms, eliminated eye glare and decreased screen shadows using this technology. Used LG PH450UG projector in perfect working condition. 3840x2160P 4K. Device set to switch to HDMI 1 when booted up to allow projection of any source material through HDMI 1 port. Keystone correction -40 degrees. Lamp life is estimated to be 30,000 Hours, Laser based DLP system. NEC U300X Ultra Short-Throw DLP Projector. HD Video Mode: 1080i. Display Type: DLP. Ultra Short Throw Technology takes the Projector usage to a new level. You can expect large images in small rooms, eliminated eye glare and decreased screen shadows using this technology. Exquizon LED GP12 Portable Projector 800 480P Support 1080P HDMI USB SD AV Connect. Smart Projector with Excellent Projection Performance. A:Yes, you can. Just do not hesitate to own one! 1x HDMI, 1x USB, 1x SD, 1x VGA,1x AV. 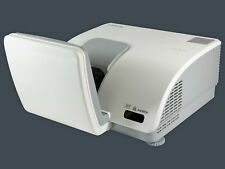 Used NEC NP-U300X Ultra Short-Throw Projector. Overheating - With a cleaned projector you can be worry free about your projector overheating. Dead Pixels - Little white/black dots is a common problem within a projector. SMART UF70W DLP Projector. ⦁ Display Type: DLP. Ultra Short Throw Technology takes the Projector usage to a new level. You can expect large images in small rooms, eliminated eye glare and decreased screen shadows using this technology. SMART UF70 DLP Projector Refurbished 1600 hr used. Display Type: DLP. Internal parts, fans, connectors, lamp and filter have been professionally cleaned to improve projector performance and extend it's life. Enjoy over 100” of stunning picture quality when and where you want it. Native 4K resolution (4096 x 2016). Ultra-short throw for flexible installation. High Dynamic Range for more realistic videos. (Local pick up is not available. excluded.). Exquizon LED GP12 Portable Projector 800 480P Support 1080P HDMI USB SD AV Connect. Smart Projector with Excellent Projection Performance. This technology protect your eyes without radiation while still allowing you to enjoy movies, sports, TV. Users can also project images over a wired LAN or a wireless network (an optional IFU-WLM3 wireless USB dongle is required for wireless connection). Smart UF75 DLP Projector. ⦁ HD Video Mode: 1080i. ⦁ Display Type: DLP. Ultra Short Throw Technology takes the Projector usage to a new level. You can expect large images in small rooms, eliminated eye glare and decreased screen shadows using this technology. NEW SMART UX80 DLP Projector. Display Type: DLP. Ultra Short Throw Technology takes the Projector usage to a new level. You can expect large images in small rooms, eliminated eye glare and decreased screen shadows using this technology. ® Captiva DHD400S 1DLP. Featuring laser illumination,the Christie Captiva DHD400S provides 20,000 hours of low cost and low maintenance operation. With a suite of easy-to-use features, multiple mounting options, instant on/off and a very attractive price point, the Christie Captiva DHD400S lets you focus on what’s important – the content. What you need to know – This product may have a serial number that uniquely identifies the item. When you need to show a large image but you do not have a lot of space to set up the projector from a long distance, an ultra short throw projector is a wise choice. This type of equipment expands your ability to show movies, slides, videos, and other types of media in a small meeting room, your man cave, or your living room. On eBay, you can choose from a variety of new and used ultra-short throw projectors at affordable prices. What are the display technologies of ultra-short throw projectors? LCD: This uses a fluorescent bulb to illuminate crystals on a glass panel. The options include traditional and tri-LCD. LED: This makes use of a perimeter or array of light emitting diodes to illuminate the display. DLP: This is "digital light processing," and it uses an optical micro electro-mechanical technology and a digital micro mirror device to create the display. What are the available inputs for ultra-short throw projectors? Composite RCA: This allows you to get analog audio. HDMI: Use this to display video from the TV. S-video: This connects with a computer and uses the projector as the monitor. USB: It accepts input from a portable USB 1.0, 2.0, or 3.0 device. VGA D-Sub: This allows the projector to work with older televisions. What are some features of ultra-short throw projectors? Portable: They are small and lightweight. Some are designed to be pocket-sized. Built-in player: Some have built-in DVD or Blu-ray disc players. Built-in speakers: This amplifies the audio part of videos. Projection options: They may offer ceiling, wall, or tilt projection. Wireless: These connect to your Wi-Fi network for displaying media. How do you choose an affordable ultra-short throw projector? Brand: Some of the options include BenQ, Epson, LG, Sony, and NEC. Resolution: The native resolution ranges from 800 by 480 pixels to 3,840 by 2,160 pixels. Image brightness: The range is less than 1,000 lumens to more than 7,000 lumens, and they are separated at 1,000 lumen intervals. Image aspect ratio: The options include 4:3, 16:9, and 16:10. Condition: Select from new, used, manufacturer's refurbished, or replacement parts.